"The child has a different relation to his environment from ours... the child absorbs it. The things he sees are not just remembered; they form part of his soul. He incarnates in himself all in the world about him that his eyes see and his ears hear." How do Beeswax Wraps work and Why are they so great? Recipes For Wonder - Hands on Experiments! We recently tried CUBOS-lite, a beautiful and open-ended sorted toy that sparks the imagination! The cube is really lovely and made of soft wood, very easily to handle even for very small hands. What I love is the the fine and simple design enables shape recognition, cause and effect, stacking, and a baby or a child learn how to open and close an object. CUBOS are special. Made from Natural maple or Birch, and has a edible beeswax finish. You don't have to worry about a small child chewing on it. The wood earth-friendly, they have a warm texture and the shape is aesthetic. It really looks lovely in our shelf . Chanel is always playing with it! It's been on my mind for a while to start Chanel with woodworking activities. Finally, during the School holidays we gathered a few tools to create some woodworking projects to encourage her imagination and creativity. Here are some ideas of how to do it at home! Above and below Chanel is creating a star pattern after hammering nails across. We used this box to storage the materials and we found this store useful for the others materials. There are many woodworking set in the market, however, I feel making our own kit was meaningful. We choose child-size but real tools and quality materials that really give us a sense of purpose. Woodworking activities include constructions, putting two blocks together using bolts, washers and wing nuts, using a screw driver to join two blocks of wood, building ladders, cars and many more. At five years of age Chanel wants to experiment and create, and I would love to get to the point where she can plan, perhaps her own bookshelf design!. We have been using a few alternatives to cling film and tinfoil to wrap our food when going out. This time I started to play a little more attention to Beeswax Wraps and wanted Chanel to give it a go making her own wraps and packing her selected food such seeds, nuts, veggies and sandwiches. Chanel used the warmth of her hands to help mould the beeswax wrap as it hold its seal once it starts to cool down. We used the children lunch pack as it is perfect for little hands and it comes in three sizes. The small is Ideal for wrapping carrot sticks and small snacks. The beeswax wraps can be fold in small pouches or in boxes. We referred to a few tutorial videos to learn to make our own. It takes just a few min to make them and a small child find it very easy. I love the Beeswax Wrap allows the food to breath. It keeps the cheese, fruit, vegetables, bread, baked goods, herbs, fermented foods and anything else you want to use them for, nice and fresh. Chanel also made a little pouch for carrying pumpkin seeds. It's lovely to have at hand a wrapping project for Chanel to help the planet using reusable, biodegradable natural materials. She tends to make wrappings once a day for her school lunches or outings. We often clean them after use then don't clean them enough - but that is part of the learning process. Our Beeswax Wraps are made of 100% cotton, beeswax from our local Beekeeper, pine resin and organic jojoba oil. The scent is absolutely delicious. I hope you enjoyed this little peek into our food packing routines Kitchen packs and the beautiful children's forest and star designs are also available from here. Wax Wraps can be used in a number of ways to help store and organise children things, such as loose crayons, coloured pencils, small toys or a toothbrush and toothpaste for an overnight stay. I have also used them for covering tea mugs, pitchers and jugs of water. Your child may also also love to play with the wraps, folding them into origami, to cover a biscuit, to keep a pack of cards, using it as a dough base, or to hold a bar of soap for travelling. I recommend beeswax for anyone looking to switch from cling film to a recyclable, compostable and good feeling material. There is something special about them! Chanel latest project was a still life colourful pear. The online lessons are fantastic, as she can pick lessons to her own level of ability and finish them at her own peace. There is no need to travel to an art school, or institution. A child can just pick from their art shelf some paints and paper and start an art lesson. In the past months, Chanel has leaned mixing colours and simple drawings. I really liked the 'frustration" lesson, it showed her how to express her feelings through drawings and paint. We use watercolour tempera and paper. As the program has different levels, I am excited to see how her drawings develop through the years. At the beginning of each lesson, I remind to my self that the objective of practising her drawing is not to impose anything, but to encourage her curiosity and make her keener to explore the world around her through art. This painting has been brighting up our wall for the past week. We rotate the works weekly, we know they are more than lovely shapes and colours , they are beautiful dreams come true. How do you encourage the sense of beauty at home? It is important for a child to spend some time in the outdoors experiencing nature every day, if possible, in all kinds of weather and during all seasons. Have you and your child adventured on a Literary walk? Here in England, the weather is so unpredictable that we don’t just sit there, we do something. We get walking, get a guide book, map, or look at our books for inspiration. The past week we decided to go exploring the secrets of Pygmalion, and also A.A. Milne and his son Christopher Robin's enchanted forest. Each adventure took us to heavenly walks. Chanel was thrilled to find many of the places she has read about in her books or seen in the films. Above is Gorge Bernard Shaw’s corner. An enchanting place to visit full of history and inspiration. Here is the small shed where Shaw wrote many of his plays. It has a rotating base to give him the best view of his garden or to stay in the sun. It is simple. Ask your child to pick a book that they like, and then get ready to go outdoors to fire their imagination in an outdoor adventure. You go searching for the location of the book where it was written or based, or where the author lived. When we are walking in the woods, we bring water, snacks, a first aid kit, camera, nets or old sieves for pond dipping, notebook and pencil, and a whistle in case someone gets lost. We also take garden scissors, string, magnifying glass, pocket knife, torch, compass, bug box, Wellington boots and a picnic rug. Chanel always bring a messenger bag to keep the findings. Mix together raisins, sultanas, nuts, dark chocolate buttons or (smarties are good), dried fruits, seeds, and toasted oats in any combination you like. Give everyone their own bag and eat as you go. We like to make up stories as we go along, tell tales about when we were young, sing songs, play hide and seek, and theme our walk: a listening walk, shape walk, smelly walk. See how many different smells you can find and identify. This time we took honey sandwiches, a book of Pooh stories and poems, sketch books. And for our Pygmalion walk we listened to and sang the songs of My Fair Lady on the way, read aloud Shaw’s book chapters, and learned about him and his life at the house where he lived and wrote all his plays. We will be going on many more literary walks this Summer. I would love to hear where you will go! Easter time is a joy for us, we can spend time together as a family and even take up new projects. Today, we wanted Chanel to learn how to make pasta from scratch. The process is very simple and very rewarding. We used this easy pasta maker First, we mixed 500g of all purpose flour and four eggs. This makes 4 portions. Then the mixture needs to be completely blended kneading it by hand. When the dough has taken shape is passed through the rollers turning the handle to obtain the pasta that you prefer. Chanel separated the strings of pasta before hanging it in a cooling rack. The final result, fresh home made tagliatelle! Cook and serve with fresh spinach and basil from the garden. I hope you now can make your own pasta too! We love baking, and making our own recipes.Now we are totally mad about it since we Joined BKD . The baking pack comes once a month addressed directly to Chanel and is filled with ingredients, one or two recipes, learning activity and a craft. I love the fact that the instructions booklet is easy to follow and catches the interest of a child. Today after finishing our second baking project Chanel wish was to receive this recipes “always”. This made think that whatever makes a child so interested is worthy. What sports activities you children do? We have been going to swimming since Chanel is a baby and this is the first time that she completed a self grooming and tidying cycle at the swimming pool. Showering, and getting all the swimming wear back in to place was really easy for her this time and I was happy to see her folding the towels and tidying completing the cycle. Those days of fun practise folding home made clothes squares, was here today, visible and tangible. Take a simple clothe square and make your child play and fold it , then suddenly you realise you have a grown up child who knows how to fold their own garments. We had a wonderful afternoon this weekend discovering science activities with Alom Shah. We are loving his new book Recipes for Wonder he shows you how to create exciting and hands-on science anywhere in the house. The balloon powered cars experiment was definitely a winner! 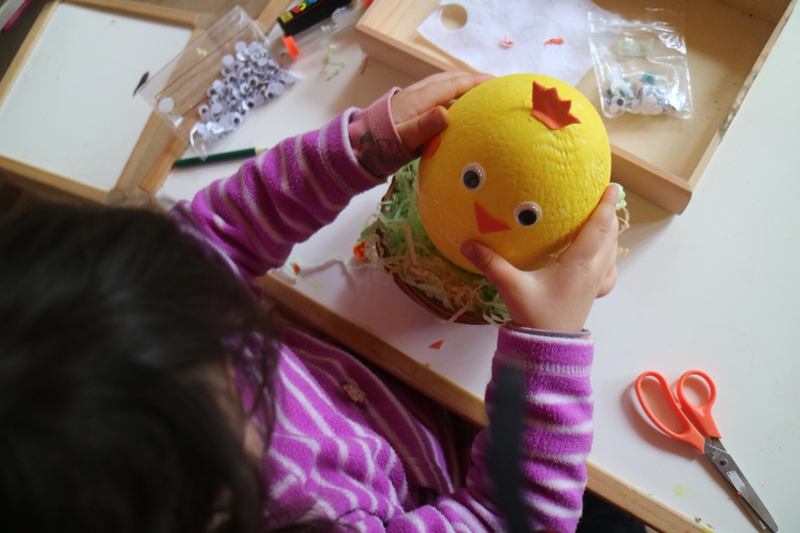 It is Easter Time and we have been doing lots of cooking, crafts and enjoying a small wave of warm weather. Chanel has been trying new recipes and making crafts to celebrate this season. We had a gorgeous bunny visitor for a few days who taught us a few life lessons. 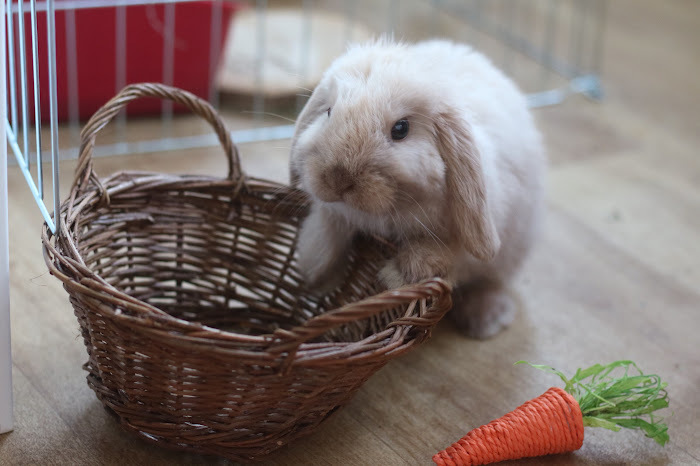 Rabbits are loving animals who like company and can be wonderful pets. If you are considering getting a rabbit for your children, take into account that they prefer to be petted, rather than to be picked up. They are easy to litter train and, with time and patience, they can be left running around inside a house. However rabbits would fit best among older children who can understand their need for independence and quiet time. Last year, we purchased a few Easter decorations, but this year we decided to use our own resources to make our own. Chanel found an egg that with some paint, will look gracious for our Easter table. This will be a time of remembering Easter traditions from other origins, and countries, to spend time with family, and to enjoy the magic of rabbits, chicks, lambs and all the other human beings and animals that are coming to life. We wish you a great Easter Time!